Restore Pressure Cleaning | Puyallup, Wa | Restoring your exterior to look like new! Experience sparkly home and business exteriors leaving you feeling happy and relieved. Your needs are our top priority. We’ll listen, take notes, remember and preform! With dirt comes stress. We clean the dirt, thus relieving your stress. Our technicians are trained down to the detail, to clean your things well with a smile. Your things will need routine cleaning to keep them clean. We can keep them clean on a schedule. We’re so sure we will meet your expectations, we guarantee it or your money back! We are protected with a #2,000,000 liability and workers comp. coverage. So we all have things around the house or business that need to get done, but we don’t necessarily have the time, knowledge, skill, or tools to do the job. So that’s why we look to hire people: we ask: “who can do what i need them to do”. We need a problem solved, but don’t know HOW to find ‘a contractor that we can trust to do that job and do it right’. They need to clean really well and thorough. They need to be licensed and insured just in case any damage does occur to your property they are accountable and responsible to fix it. Good customer service/ Treat customers well. Are you and your business important to them, even if your a small customer? They offer a recurring schedule program (where they keep track of when you would like your services throughout the year and contact you to make sure it gets done. We fill all of these criteria and we can prove it. 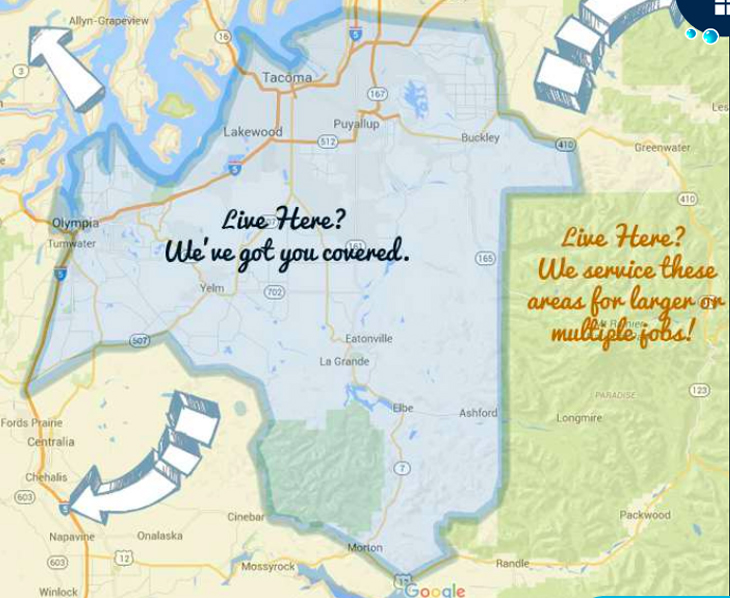 Over the years we have accumulated over 70 online local reviews from Pierce, King, Thurstan, and Lewis Counties with a 4.9 out of 5 star average on the basis of value, service, and customer service. Because your fellow neighbor recommends us, we hope that is the evidence you need to choose us to work with you. To get a free estimate and or consultation check out the get a bid button. See you soon. Online service selection and booking or over the phone scheduling just as easy. Easy online payments and optional automatic payments. Inspection detailing which areas of your home need help. Our equipment ensures you get the highest quality clean. Every technician will arrive in a clean, crisp uniform. “Did an excellent job power washing the concrete at my house. It looks brand new!” Alan C.
“Punctual, leaned both roof, gutters, and treated roof for moss killing. Well mannered, clean appearance and careful. Asked if we had a compost pile that we wanted anything added to. which i thought was a nice gesture. We plan to have them out to power wash the driveway when we are ready and may have home clean the outside of our windows since we have a tall house.” Hank L.
“Erik from Restore WA, did an amazing job on my roof and gutters. The roof had not been done in a few years and looks like new. The gutters look wonderful and debris free… I will continue to use Restore WA in the future, to help keep my roof and gutters clean. Very polite, professional, and a pleasure to be around. I highly recommend this company!” Colleen C.